Hosts Amanda Mead, left, and Rita Vigil record I Don't Know Her at Mead's home earlier this month. Jeanette Rankin — do you know her? If you don't, then Amanda Mead and Rita Vigil have found another woman whose life and accomplishments warrant more recognition than it receives. 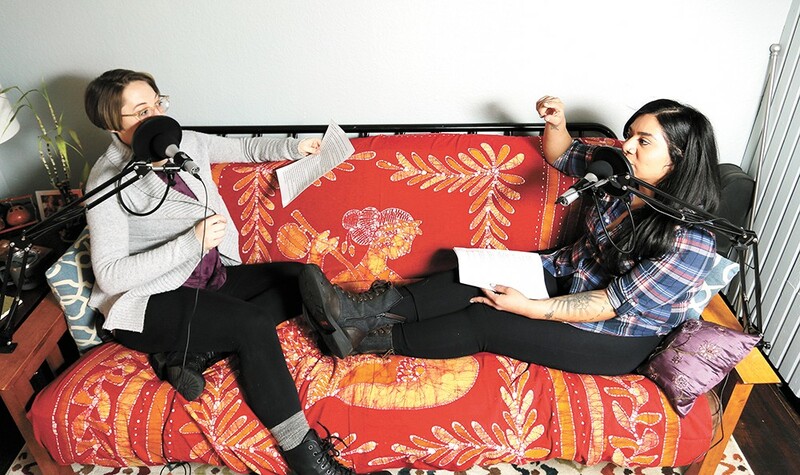 The two Spokane women started their weekly podcast, I Don't Know Her, earlier this year to share the stories of women you've maybe never heard of — but should have. Mead knew three things about Rankin before Vigil brought her story to their makeshift recording studio in an upstairs guest room at Mead's house doubling as the laundry room. Mead knew that Rankin was from Montana, was the first woman elected to Congress and was the only person to vote against entering World War I and World War II. What Mead, a high school librarian, didn't know was that Rankin was gay, she says. "As a queer little girl growing up in eastern Montana," Mead says. "I would have loved to have known that." "What would have made a difference in her life had she had that queer female as a role model?" Vigil says. "And that's what we need, and what we need to bring to the forefront." Mead and Vigil are telling these stories because they would've loved to have these women to look up to. "Think of that woman that is significant in your life," Vigil says. "And think about all the women that could be that for you, that you don't know. Think about what you're missing... So why not listen to something for an hour and learn something new and inspirational?" I Don't Know Her is Mead's brainchild, but it took a while to come to fruition. Mead grew up watching her aunt and mother work at, and eventually own, the local radio station in their small Montana town. And when podcasts became more accessible to hosts not sponsored by major networks, Mead knew she wanted her own. She kept a journal of podcast ideas and then would check to see if the idea had been taken. They usually were. Then one night when Mead couldn't fall asleep, the idea to talk about women who aren't household names, but accomplished huge feats, came to her. She checked, and there were other podcasts with similar concepts, but nothing like what she wanted to do, so she called Vigil. Vigil, unlike Mead, had never done anything like this before. But the thought sounded fun. Their first episode wasn't their best work, Vigil says, but it made them laugh. "It's shaking out those cobwebs, but then as soon as it became me and her as best friends in a room, discussing and discovering these issues together, it's gotten a lot easier," Vigil says. Mead knew that she didn't want to embark on this adventure as a solo act because her favorite podcasts have two or three people who share chemistry. And for Mead and Vigil, talking to each other has never been an issue in their six-year-long friendship. The two not only host a podcast together, but also run marathons together and share a best friend. They met through Mead's wife, Abbie Speer, who worked with Vigil at a local brewery in 2013. As Speer and Vigil became close friends, so did Mead and Vigil. "We make each other laugh," Mead says. "I knew I wanted [the podcast] to be funny, too, and I didn't want it to be like, 'Let's have your history lesson of the day, kids.'" I Don't Know Her features more than just the triumphs of women past. The podcast also highlights the challenging, but genuine, narratives from their own lives as mothers, full-time employees and as people handling their own issues — with plenty of comedy and cursing. And that's why people should listen. The duo releases their hour-long episodes every Friday on their website, idkher.com, Apple Podcasts, Stitcher, Google Play, Spotify, TuneIn and SoundCloud. The original print version of this article was headlined "Informal Introductions"